New Jersey’s defined benefit pension systems are underfunded by more than $170 billion, an amount equivalent to 44 percent of gross state product (GSP) and 328 percent of the state’s explicit government debt. Depending on market conditions, the state will begin to run out of money to pay benefits between 2013 and 2019. The state’s five defined benefit pension plans cover over 770,000 workers, and more than a quarter million retirees depend on state pensions paying out almost $6 billion per year in benefits. 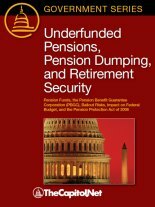 Nationwide, state pensions are underfunded by as much as $3 trillion, approximately 20 percent of America’s annual output. Although the PBGC’s liabilities are not explicitly backed by the full faith and credit of the federal government, Congress could face political pressure to bail out the PBGC at taxpayer expense should the agency become financially insolvent.